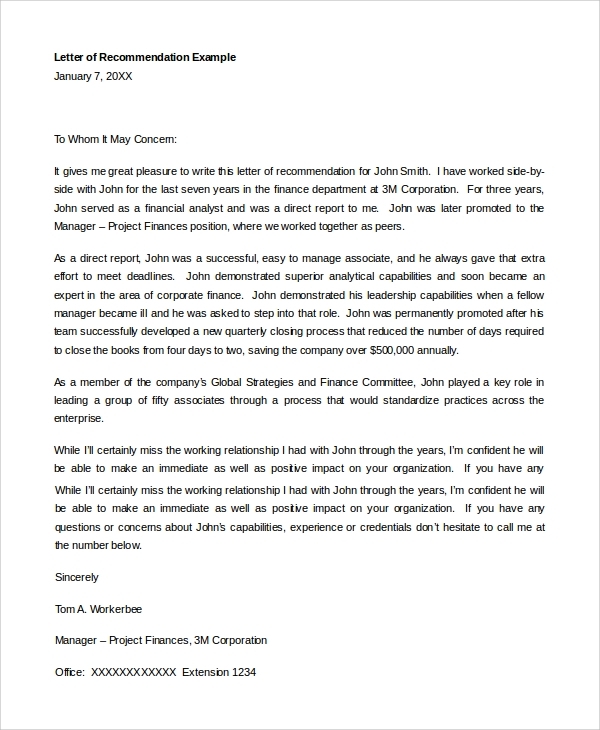 A recommendation letter can also be defined as a reference letter in which the writer mentions about the skills, capabilities, and qualities of the person who is recommended through the letter in order to accomplish a motive of job or admission. 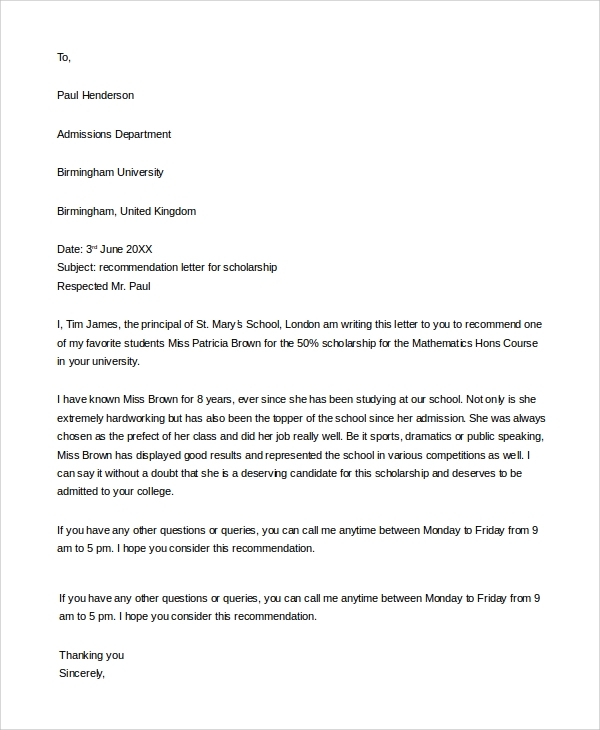 The Sample Letters of recommendation for a student is written by an authorized personality to a university or school or in a particular educational institute to recommend a student for admission. 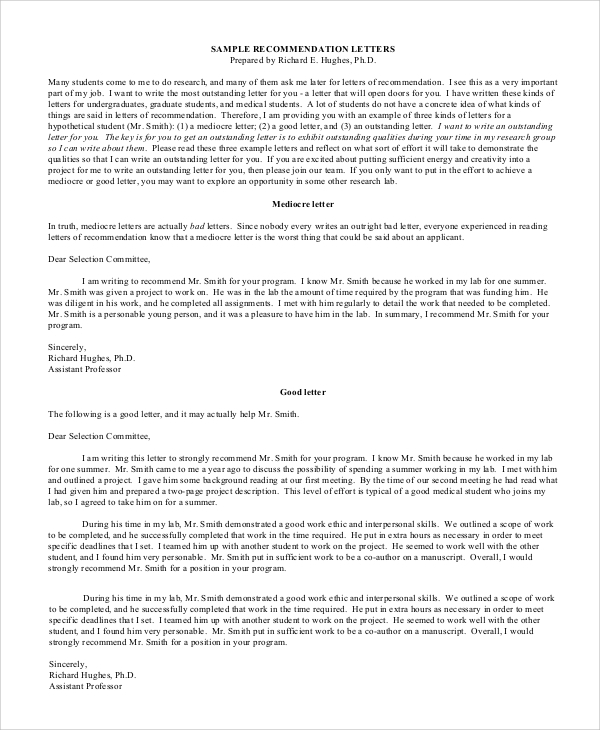 Here is some Sample Letters of Recommendation for students. 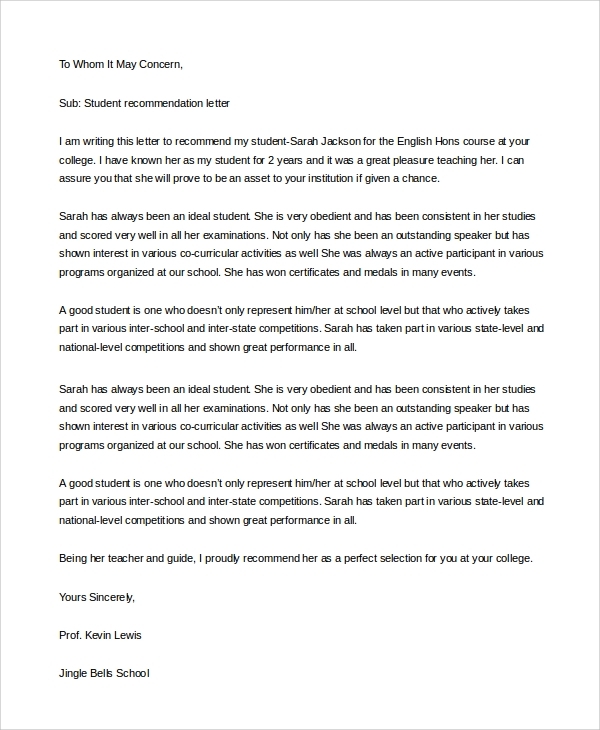 This letter is written by a teacher to another teacher of a particular college or university to recommend a student by his skills and abilities so that the other person can be convinced for the admission of that student. While writing the letter of recommendation for a student, firstly you have to mention the complete address of the organization to which you are writing the letter followed by the student’s name. Then, address the faculty to whom you are writing the letter and after that, write the content of the letter by stating all the skills and talents of the student. In the end, write your name with signature. 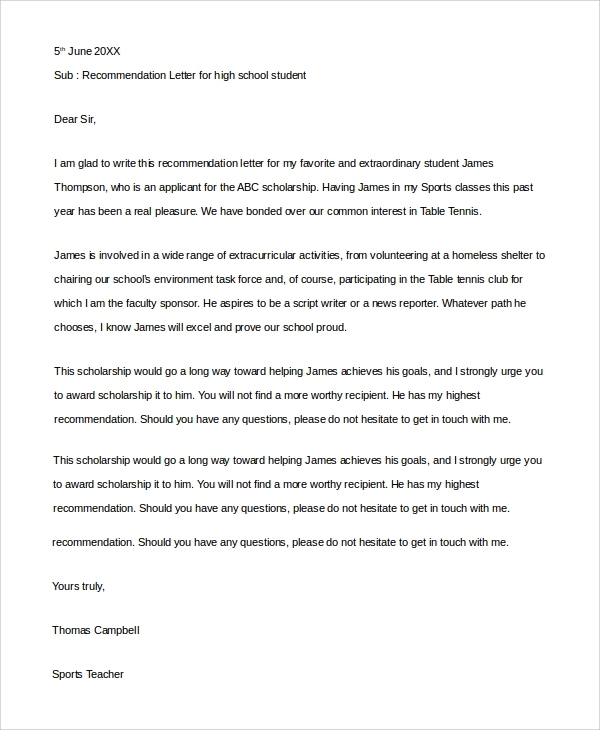 This letter of recommendation for a student is written by a school faculty to the principal of a college to which a student of their school wants to get admitted to a particular course. The school faculty has to mention all the achievements of the student to portray an impressive image in front of the principal. 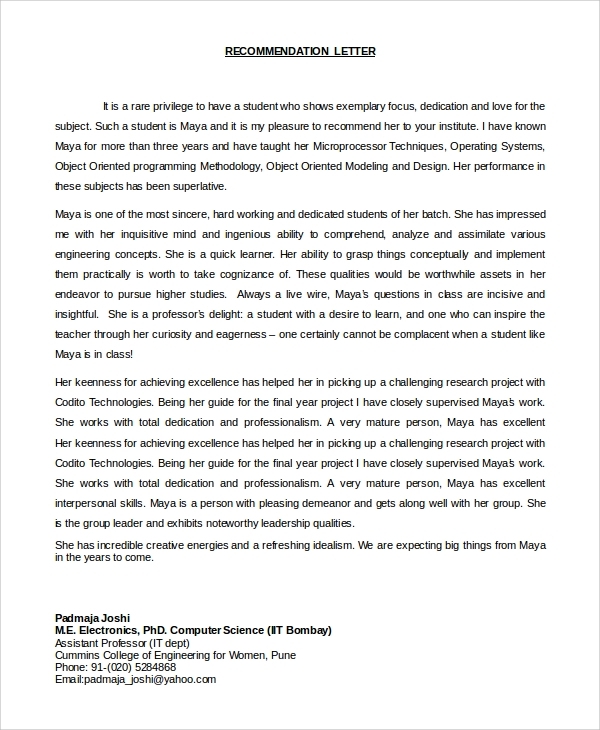 The letter is written by a school faculty to the admission department of a college to which the student is interested in taking admission in and this letter will help the student in getting the scholarship to the student due to his/her achievements, awards, and skills. 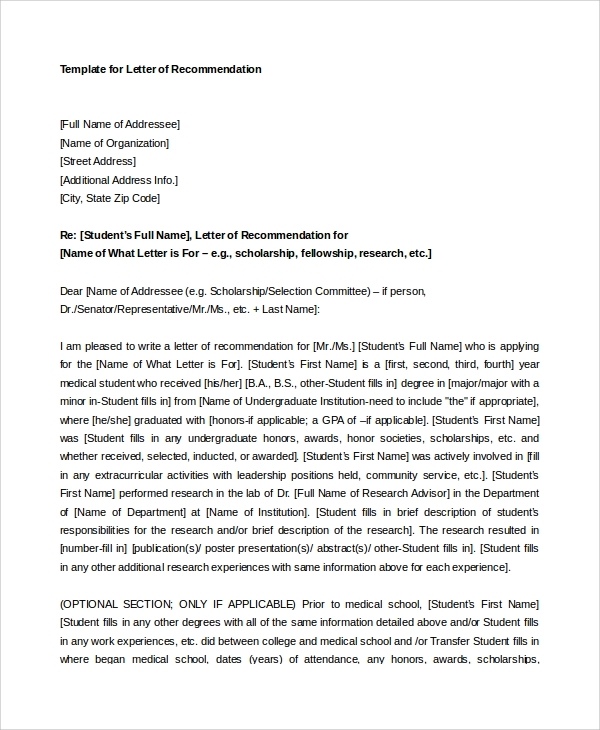 This letter is written by an ex-colleague of a research department in the field of medical to the authority of a medical college to recommend a candidate by seeing the capability of that candidate that he can do something worthy in the field of medical after getting admission in that medical college. What Content Should be Included in a Recommendation Letter? A person who is writing a Sample Letter of Recommendations for a student should include all the capabilities, skills, and achievements of the student. He should write the letter in such a way that it will create a good impression in the mind of the second party that he/she gets forced to admit the student in his/her college because of the student’s accomplishments. It should be concise but it should contain all the relevant material in it because it can be crucial for your admission in your dream university. A person should be truthful while writing the recommendation letter as it increases the expectations from the candidate. If a college authority gets disappointed from him/her, it can affect the student’s career in a negative way. Is it Necessary that the Person Writing the Recommendation Letter Should be Famous? No, it is not necessary but it can be an advantage if the person writing the recommendation letter is famous enough because it will have a great impact on the college administration. If the individual who is writing the letter is specialized in a field you are applying for, your chances of getting a proper consideration for admission will increase to a greater extent. So, whenever you are going to approach someone for writing your recommendation, try to approach a specialist of the field you are applying for because it will result in your favor. Keep these things in mind while selecting a person for your recommendation letter. All the possible examples of letter of recommendation for the students are mentioned here for your reference. Try these key points to implement while writing the letter of recommendation for a student for making it attractive and worthy. 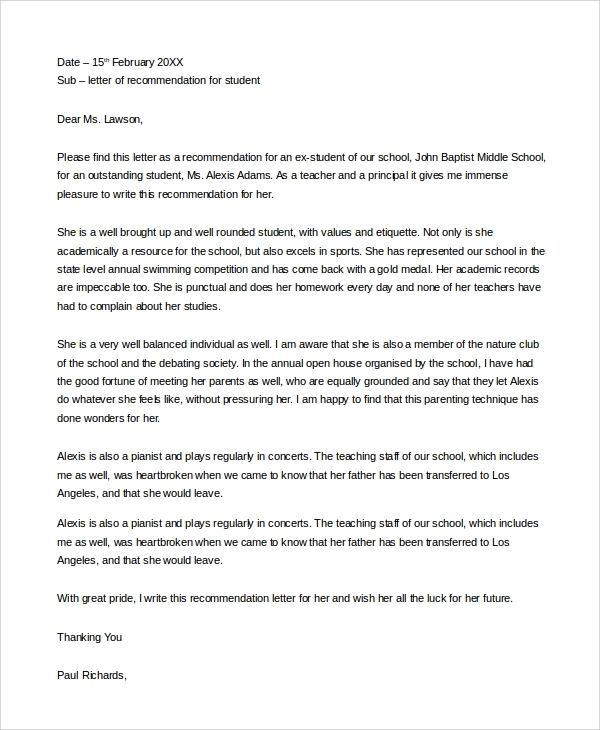 The Sample Letter of Recommendation for Teacher In Doc is available on the internet; you can google it easily.